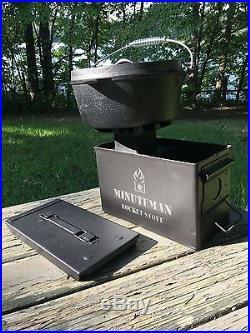 The Minuteman Rocket Stove is one of the most compact, portable and efficient rocket stoves on the market today, making it perfect as a survival, camping or expedition cook stove. As a result of its rocket stove design and internal ceramic insulation, the Minuteman Stove reaches operating temperatures in excess of 1300 degrees. Even large cast iron Dutch ovens, canners and full sized stew pots are no problem for the Minuteman. 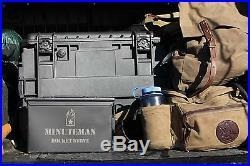 Its’ highly insulated construction allows for minimal heat loss and focuses the heat where it is needed… Due to the premium, ceramic refractory insulation that fills the space between the burn tube and the military ammo can chassis, the Minuteman can be safely used on a wood picnic table without damaging the wood. The extremely high, internal heat double burns the combustible gases and results in a smokeless flame. In a survival situation, this keeps others from detecting your location and advertising that you have food. When camping or tailgating, a smokeless fire will make you much more popular with the neighbors, and you do not go home smelling like you and your gear spent the weekend fighting a forest fire. 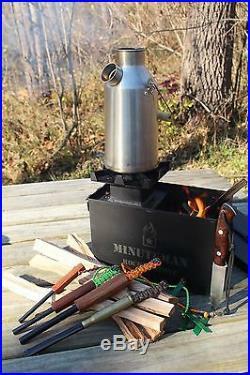 The Minuteman requires much less fuel (small sticks, pine cones, bramble, biomass) than the larger rocket stoves and uses less than 1/10th the wood required by an open cooking fire or wood burning cook stove. The fuel is readily available in most any environment and requires no saws or splitting to process. This results in a huge time and energy savings from collecting and processing firewood and affords sustainability even in a city or suburb. These points are extremely important. Calorie conservation is a primary concern and important strategy when confronted with a long term survival situation, and the elderly or handicapped may not have the physical ability to do the work required to sustain a open fire kitchen. Furthermore, most of us live in a city or suburb and may not have access to an adequate and sustainable supply of fuel if using traditional wood burning cooking methods. The Minuteman solves these problems and is also fast to light and easy to use. Gather a handful of sticks and twigs, start your fire, and you will be cooking in less than five minutes. 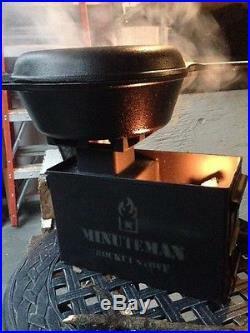 The Minuteman is the only self-contained rocket stove on the market. Once you are done cooking, dump out the coals, let it cool down (10 minutes), reattach the lid and the Minuteman is ready to travel. 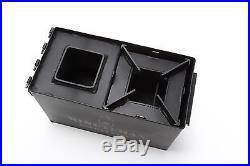 The lid has a rubber seal. No smell or soot will get inside your vehicle. 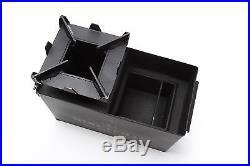 It travels and stores just like a clean ammo can and weighs 14 lbs… Perfect for a vehicle survival kit or RV/car camping. 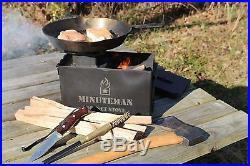 The Minuteman is not your typical “consumer grade”, sheet metal stove and is designed to last many years of daily use. The Minuteman is made in America and features a heavy gauge 1/8 thick steel burn tube. 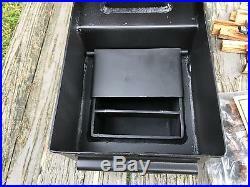 It is hand welded and the most rugged insulated rocket stove available. We stand behind our products. We have never had a customer require service on one of our stoves… 0% defect rate so far. They are that tough. 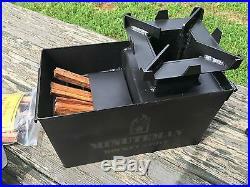 Order your Minuteman Rocket Stove today. Most customers receive their stoves in just a few days. 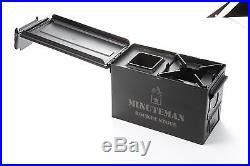 The world is not getting any safer, and a Minuteman Rocket Stove will certainly make bad times much better. 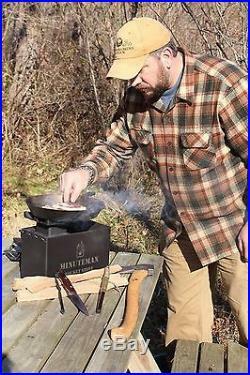 If you are just looking for a camping stove, The Minuteman excels in that role too and is much more fun to use than fuel stoves. You get a cooking stove and mini campfire all in one without the work of clearing a fire ring, feeding a large fire and cleaning it all up. Put your campfire right on the picnic table… How cool is that! Tea Kettle in photo not included. Watch The Minuteman boil 5 pounds of potatoes in an eight quart Dutch Oven at You tube. 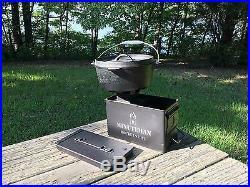 The item “Minuteman Rocket Stove for Camping Preppers Survival Hunting Boy Scouts” is in sale since Monday, June 05, 2017. This item is in the category “Sporting Goods\Outdoor Sports\Camping & Hiking\Camping Cooking Supplies\Camping Stoves, Ovens & BBQs\Camping Stoves”. The seller is “minutemanlane” and is located in Reidsville, North Carolina. This item can be shipped to United States.